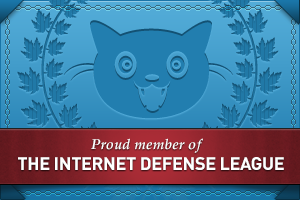 It is with some interest that I am watching the development of a movement to better mobilize the Internet (like those who defeated SOPA and PIPA) – the Internet Defense League. I’ve signed up as a member myself, but I have currently declined to let them use my blog as a place to display alerts without my control. Instead, I’ve decided to pass along those which are of interest. Like Batman and the Bat Signal, the Cat Signal is intended to alert the Internet of causes worthy of concern. Current members at the time of launch include Fight For The Future, Public Knowledge, the EFF, and Open Congress. If you are interested, please feel free to join as well. Just signed up. Had just posted a comment on the internetgovernance.org site wondering what could be done. Milton Mueller has an insightful post at http://www.internetgovernance.org/2013/09/05/meltdown-ii-the-unilateral-right-to-amend/ about ICANN’s unilateral right to amend Registry Agreements and the NTIA’s presumable influence. He also notes that it was law enforcement interests promoted by the govt that led to challenges in negotiating the RAA.